Posted January 15, 2019 by argus & filed under Sales. Joseph Mendola, Senior Real Estate Advisor at NAI Norwood Group, represented the seller and assisted the buyer in the sale of Sand Hill Mini-Storage located in Hinsdale, NH. The 17,710 square foot storage facility sold on January 11, 2019 for $1,250,000. 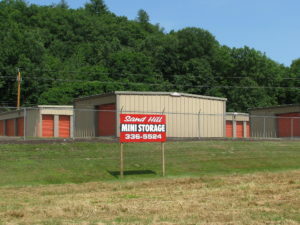 This self-storage facility is located on the main street in Hinsdale, NH, just a few miles from the Vermont border. The facility is located on a flat piece of ground and sold with pre-existing approvals to build two additional buildings. The property also includes an auto repair shop that existed on the site prior to the construction of storage units and presented potential environmental issues related to auto repair. However, the seller did a wonderful job of disposing of the tanks on site and the property received a clean bill of health from a phase II environmental assessment. The seller created value with the permits for expansion and the existing auto shop on the property. Joseph Mendola was able to convey the opportunity to the buyer and the new owner is excited about the expansion possibilities and the conversion of the auto shop into 3,750 square feet of climate controlled self-storage. The buyer plans to merge the operations of another facility they have close by with this facility, which will create a significant economy of scale for their operations. Both the buyer and the seller believe they received good value from this sale. Joseph Mendola is located in Bedford, New Hampshire and is the Argus Self Storage Sales Network broker affiliate for northern New England. He can be reached at 603-668-7000 ext.203. Based in Denver, Colorado, the Argus Self Storage Sales Network (ASSSN) was formed in 1994 to assist owners and investors of self-storage with their real estate needs. Through the years, Argus has assembled a network of real estate brokers experienced in self-storage and income property investments. Now the largest self-storage brokerage network in the United States, the ASSSN has 36 Broker Affiliates covering nearly 40 markets. These brokers are able to meet the needs of self storage investors and owners whether it is acting as a buyer’s agent or listing and marketing a property. For more information call 1-800-55-STORE or visit www.argus-selfstorage.com.